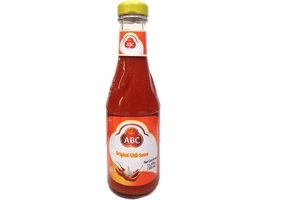 ABC Chili Sauce Tropical (Sambal Asli ABC) in 11.5 Fl oz (325 ml) Bottle. The famous Traditional Indonesian Chili Sauce with chili and garlic blend of tomatoes, chilies, vinegar, sugar and spices. Sambal ABC Sambal Asli is use as a condiment and is perfect for dipping Fish Crackers (Kerupuk) and may also be added to any fried rice or noodle dish, or simply try it on hotdog or pizza. Product of Indonesia. Halal Certified حلال .